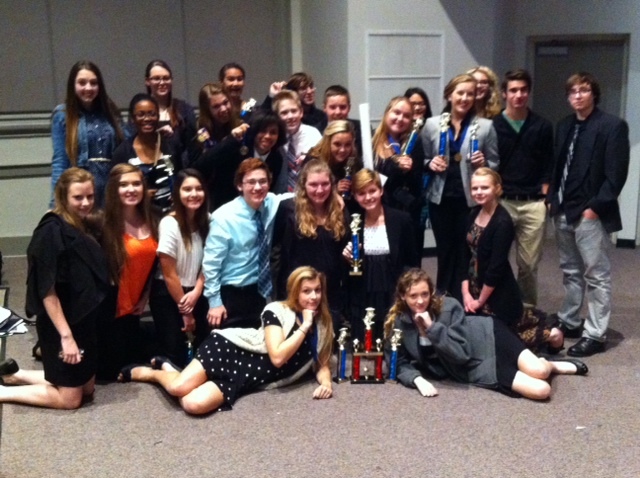 Arlington HS Speech Team. Photo courtesy of AHS Speech. 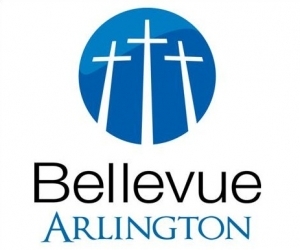 Depleted by illness and coming off a two month intense preparation process for School House Rock, the AHS Speech Team performed well at the Bartlett Invitational Speech Tournament on November 1. AHS placed 3rd out of 9 schools behind Collierville and Henry County. Several team members will travel to Paris, Tennessee on November 8 to compete for scholarship money at the Ruby Krider Invitational Tournament. 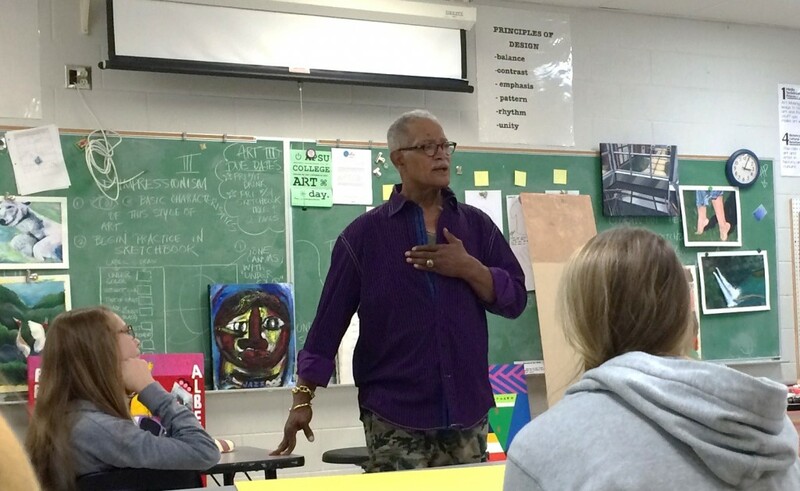 Acclaimed Memphis Artist George Hunt spoke to Arlington High Visual Art Students about his experiences as an artist and art educator. Staff Photo. On October 21, Arlington High School Visual Arts students had the opportunity to listen and learn from an acclaimed artist—Memphis painter George Hunt. Hunt, who taught art in the Memphis City Schools for 36 years, regaled the students with a mixture of stories about his journey to becoming an artist and aphorisms encouraging the students in their artistic development. AHS Players of the Week against White Station: JoeJoe Stevenson, Offense; Jonathan Mabone , First Citizens National Bank Player of the Game; Ryan Flack, Defense; Billy Speight, Special Teams. Staff Photo. The Arlington High School Tigers Players of the Week for the October 17 loss to White Station were recognized at a recent team meeting. The Offensive Player of the Week, senior Wide Receiver Joe Joe Stevenson tallied up 102 yards in seven catches. FCNB Player of the Game, senior linebacker Jonathan Mabone made a total of 12 tackles, including five tackles for a loss and one sack for the Tigers. Head Coach Chris Wiley praised the Tiger’s Player of the Week for the Defense, senior cornerback Ryan Flack: “In a night where we struggled offensively, he was a bright spot.” Special Teams Player of the Week, Billy Speight, one of the AHS team captains, was honored for the quality of his snaps. 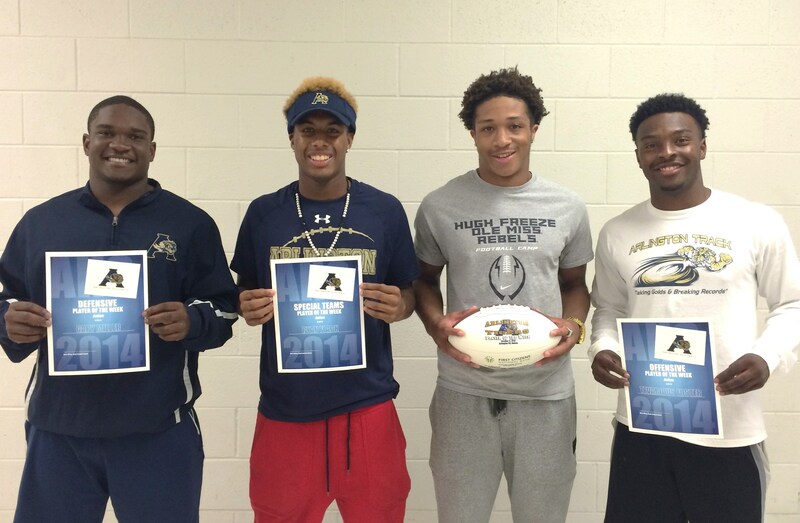 AHS Players of the Week against Bolton: Gary Miller, Defense; Ryan Flack, Special Teams; JoeJoe Stevenson, First Citizens Player of the Game; Tevarious Foster, Offense. Staff Photo. 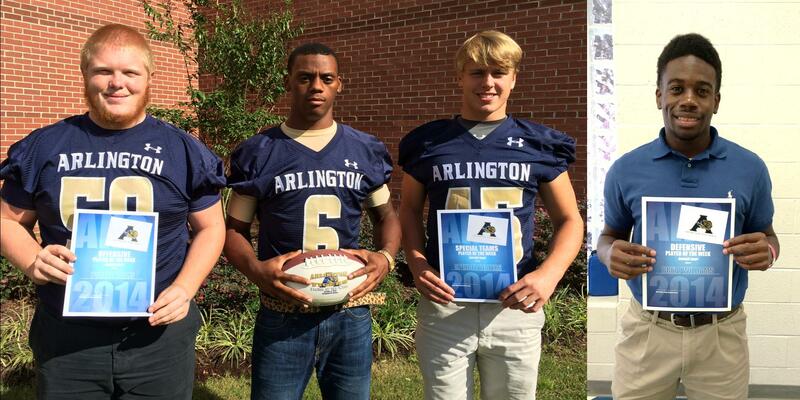 The Arlington High School Tigers Players of the Week for the October 3 38-0 shutout against Bolton were recognized today at a team meeting before tonight’s big matchup against the Spartans of White Station. We’re starting to get even more familiar faces, as two players–T Foster and Ryan Flack–have already been honored this season. Tigers Head Coach Chris Wiley singled out the Player of the Week for the Defense, Junior strong safety Gary Miller (#32): “He has continued to impress me with being in the right place at the right time.” Miller had seven total tackles against the Wildcats, including two for a loss. Special Teams player of the week, Senior cornerback Ryan Flack (#34) was recognized for three tackles and a blocked punt. FCNB Player of the Game, Senior running back Joe Joe Stevenson (#3) rushed for 114 yards on six carries, had four receptions for 33 yards, and two touchdowns. Special Teams Player of the Week, Trevarious (“T”) Foster (#15) was honored for 79 yards on the ground in four attempts, one reception for three yards, and two touchdowns. AHS Players of the Week against Raleigh-Egypt: Parker Evans, Offense; Jonathan Mabone, First Citizens National Bank Player of the Game; Spencer Waters, Special Teams; Brett Williams, Defense. Staff Photos. 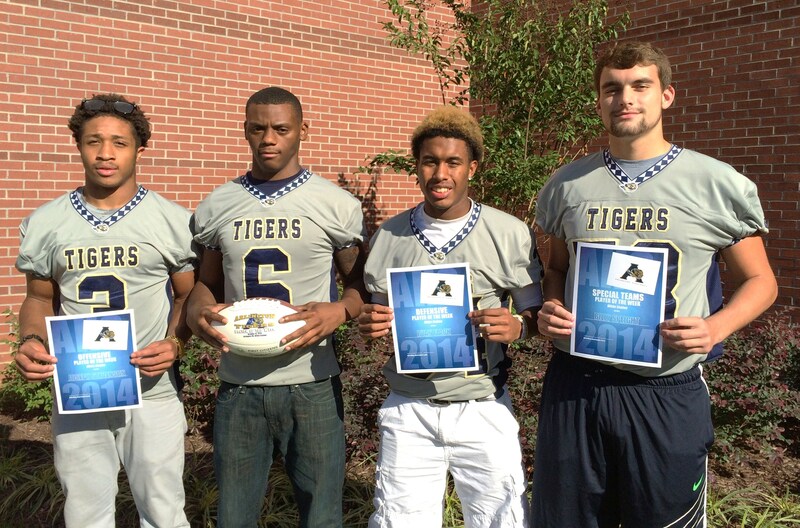 The Arlington High School Tigers Players of the Week for the September 26 (42-6) victory against Raleigh-Egypt were recognized at a recent team meeting.